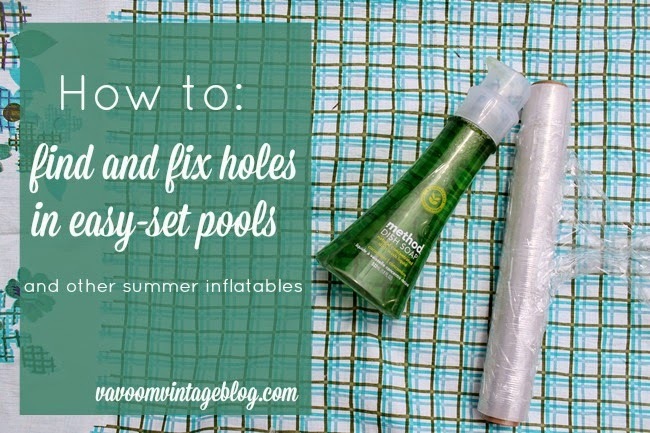 Fixing a hole in a pool or summer inflatable is easy. Finding the hole is a different story. Instead of throwing the item out and buying new, here's a simple thrifty tip to find and repair the hole and save more money for fun this summer! Our little 1930s home has a small back yard but we recently re-arranged and made the most of our cozy space with a swing, easy-set pool and my own little corner to sip lemonade and watch the kids play. We set up our pool a few weeks ago, a little early- but it's been hot in St Louis. The next day, the top ring was deflated. Even with the cover on the pool, I had been spotting some cheeky birds leaning over for a drink and I bet at night some larger critters tried to climb up and cool down. Those pokey little feet and claws are no match for the plastic. For an hour or more, we scoured the ring for holes, unable to find any. We listened closely, felt around, even pushed the ring into the water to see if any bubbles popped up. Pj laughed, "Maybe we should fill it with water and see where it leaks out!" The neighbor offered up his air pump. Finally, we found two smart and easy solutions that you have in your kitchen right now and you won't believe how easy it is- plastic wrap and dish soap! Lay it over the ring and smooth out the air bubbles. If there is a hole, the plastic wrap will get a big air bubble in it. Simply slide the plastic around the ring till you've found the culprit. Make sure to check the under-side of the ring as well, those tiny holes could be anywhere. Soap up your hands with a high quality dish soap. We tried an inexpensive off brand but it didn't bubble enough so I switched to Method (Method cucumber is the best dish soap in the land!) and once you have a good lather, give the ring a thorough rub down. When you hit a hole, the air coming out will blow bubbles in the soap. After searching for holes for a week, these two fixes found our holes in minutes and we were back to splashing and laughing the next afternoon and having our scheduled pool party with the cousins on the weekend. Never let a pesky bird foot ruin your pool party again! Seriously cool tip, dear Brittany. Thank you for sharing! I was so surprised to find this actually worked! I used Dawn and sure enough the air bubble came up. Thank you so much for the tip. I had just bought the giant swan when the wind picked it up and blew it into a rose bush....I put a patch on it and it is holding air now...thanks again! I tried it with a light soap solution and could not find the leak (tiny pinhole). Be sure to use 1 part dawn to 4 parts water. This will work.